Our recent study considers the dynamics of classical and quantum models, in particular ring geometry: (a) with classical particles that perform random walk in disordered environment; (b) with quantum Bose particles whose dynamics is coherent. Details on (a): it is possible to induce non-equilibrium steady state current, which requires e.g. a radiation source. One question that has been addressed concerns the relaxation of such current, and how it depends on percolation and localization properties of the model. Details on (b): there is a possibility to have a super-current that does not decay even in the absence of an external driving source. This is known as super-fluidity. The study provides a theory for the meta-stability of such flow-states. A central observation is that the analysis should take into account the chaos that prevails in the classical limit of the model. It is the first time that the theory of "chaos" meets the theory of super-fluidity. Background: Circuits with condensed bosons are the building blocks for quantum Atomtronics. Such circuits will be used as QUBITs (for quantum computation) or as SQUIDs (for sensing of acceleration or gravitation). We study the feasibility and the design considerations for devices where the atoms are confined to move in a several-site geometry (so called Bose-Hubbard system). For SQUID-geometry the sites form a ring with a weak link. 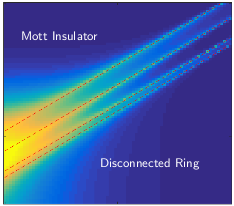 Such ring can support super-flow (non-decaying persistent currents). If used as a QUBIT, the anti/clockwise flow-states can represent the digits "0/1". It is essential to realize that the full theory for the meta-stability of such flow-states, and for the feasibility of coherent operation, involves novel "Quantum chaos" considerations. Adiabatic processes are a fundamental family of physical processes, wherein a system is guided from an initial state to a target state via slow variation of control parameters. One such familiar protocol is known as 'Stimulated Raman Adiabatic Passage' (STIRAP); one application of STIRAP is to move atoms in space. The concept of adiabaticity can be illustrated by considering the example of serving a teacup full-to-its-brim. In order not to spill any fluid, the process has to be carried out sufficiently slowly so as not to generate ripples. Using a more general physics vocabulary, the slowness of changing the control parameter (the teacup's position) should ensure there are no unwanted 'excitations' (ripples) which would lead to the loss of fluid. In a new manuscript, published in Physical Review Letters, Prof. Amichay Vardi and Dr. Amit Dey from the Department of Chemistry, and Prof. Doron Cohen​ from the Department of Physics​, explore what happens when adiabatic passage is carried out in many-body cold atom systems. The researchers found that during its evolution, the system encounters brief chaotic intervals during which its behavior becomes erratic, a fact that had been ignored previously ignored. Due to these chaotic intervals, and in sharp contrast to our teacup example, adiabatic processes become inefficient if they are carried out too slowly, because the system has time to 'ergodize'. Thus, according to the researchers, the optimal adiabatic passage rate, is determined by the the interplay of the standard demand to avoid single-particle excitations, and the need to quickly traverse the many-body chaotic stage. Figure: The dynamics of the system is illustrated in phase-space (an abstract space that accomodates all possible states of the systemI. The red cloud indicates how the evolving state of the system is stretched in phase-space due to chaos. 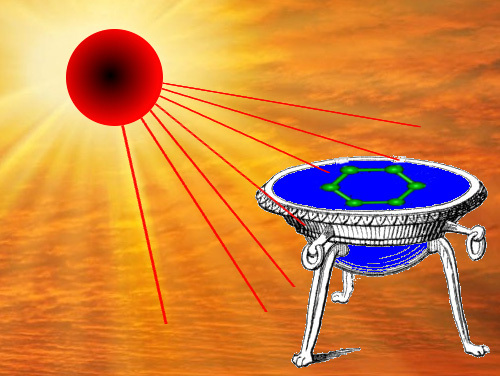 Without chaos the red cloud would be locked at the center instead of being smeraed over the chaotic strip.